Have you ever heard of SDGs? SDGs are Sustainable Development Goals that have been adopted at the United Nations General Assembly, and 193 member countries are trying to achieve regardless of the level of the country's development. Local government, universities, companies, and research institutions are pouring efforts in order to achieve the 17 goals of SDGs. 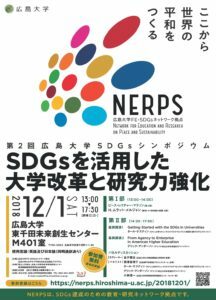 Hiroshima University is also in the pursuit of SDGs under the new long-term vision "SPLENDOR PLAN 2017". 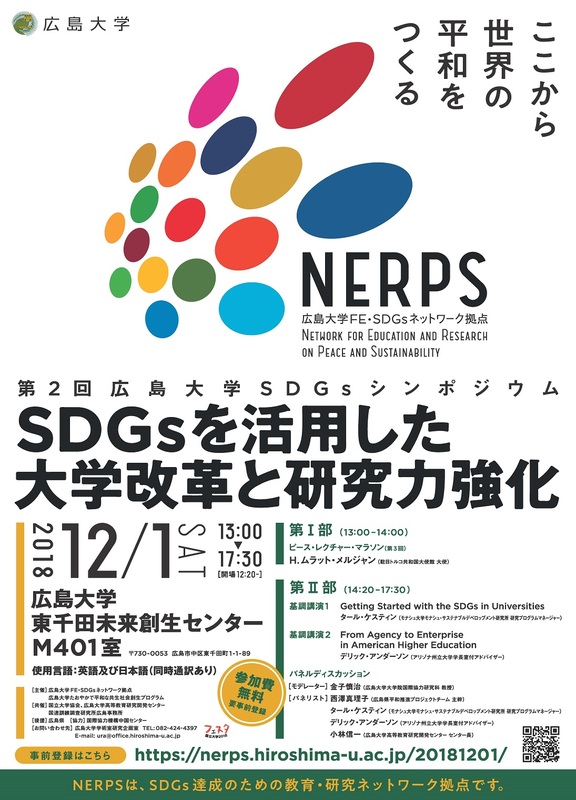 The 2nd Hiroshima University Symposium on SDGs will be held on December 1st. Part 1 of the symposium is also the 3rd Peace Lecture Marathon, and we invite Ambassador H. Murat Merchan of Embassy of the Republic of Turkey in Japan. He will give a special lecture and will be awarded the title of honorary distinguished professor. In part 2, the invited professors from overseas will talk about the efforts on SDGs of their own institution and we will think about the future plan of under the theme of "The Nexus between Global Goals and Research Enhancement through University Reforms". This event is open to all. ※Shuttle bus will be available between the Higashi-hiroshima campus and Senda campus.